You may have had a sundae with a side of cookies but in this simple concept, the cookie become the sundae. A cousin of the ice cream sandwich, a cookie sundae is a lot easier to make. Try it tonight! ICE CREAM: Vanilla is always a good bet, but for excitement try matching ice cream and cookies: coffee ice cream with espresso chip cookies, pumpkin ice cream with spice cookies, rum raisin ice cream with oatmeal raisin cookies, and so on. 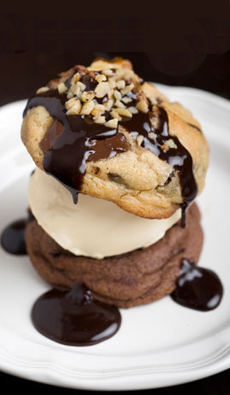 Easy lusciousness: a cookie sundae. Photo courtesy KodiakCakes.com. TOPPINGS: Consider a flavored whipped cream—bourbon, salted caramel or spice (recipes). Thanks to Kodiak Cakes for this idea. Find more of our favorite cookie, ice cream and dessert recipes.